It’s no secret that dogs are sociable creatures who are happiest being with others and having something to do. Not to get overly philosophical, but everyone needs a purpose. If you work from home or have the opportunity to take your dog to work with you, then you’re fortunate. But if your current lifestyle requires leaving behind Fido for long stretches of time, you’ll want to have a few tricks up your sleeve for keeping him happy and engaged. Obviously, safety is the first priority. Your dog won’t be happy if he gets hurt. So make sure your pup can’t reach cords to chew, harmful chemicals to drink (like bleach or antifreeze), or anything else that could pose a danger. Depending on your pup’s age and inclinations, you may choose to crate your dog when you’re away or confine him or her in a mudroom or laundry room. A word on crates: this may make your dog feel even more pent up, so when you let him out, he may run wild -- and really, can you blame him? If this sounds like your dog, then the crate may not be the best option. While every dog needs exercise, some need a LOT of exercise. Lab pups and Border collies are two such breeds that are high energy. They will need to have a positive outlet for their energy on a daily basis, or they will find their own. This may mean taking them out on an hour walk in the morning before you leave for work and another hour walk when you get home. 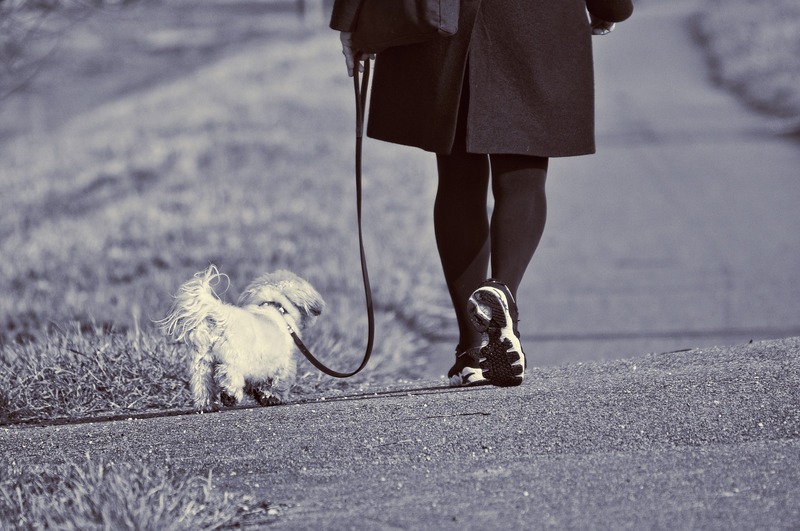 Enlisting the aid of a midday dog walker to help both you and pup can also help maintain your sanity. Interactive puzzle games, peanut butter stuffed Kongs, or other appropriate chew toys will help your dog stay engaged in something positive rather than in search of other entertainment. It’s worth experimenting with different toys to see what your dog likes best. There are a variety of webcam options for monitoring your dog while you’re away. Options range from specific devices created for this purpose to configuring Skype on a home computer to see (and talk to) your dog. This will allow you to see how your dog is getting on, and if there’s a problem, you can enlist an emergency contact to help. There’s boredom, and then there are bigger issues like separation anxiety. If you’ve tried the techniques above -- including ensuring your dog gets another hour a day of exercise -- and he’s still unhappy, then you may need professional assistance to work with you as the problem can run deep. Signs of separation anxiety include barking or whining for long stretches at a time when left alone. Frequent destruction is another sign of separation anxiety. If you suspect your dog is highly anxious, you can ask your veterinarian for suggestions. For most dogs, however, it simply takes more exercise and socialization to be happy. A couple quick trips around the block a day and the occasional playdate aren’t enough. Would it be for you? Instead, try adding some of these tactics to your routine and see if you don’t have a happier dog.